At the start of the New Year, probably few investors and market participants would have expected that during the first three months of 2015, various equities would have produced such significant double-digit gains. Although the MSE Share Index ‘only’ increased by 13.4% during the first quarter of 2015, a deeper analysis of the components of the index shows the strong outperformance by a number of equities. In fact, it is quite remarkable that 12 equities posted double-digit gains in the first quarter of 2015 with three share prices registering performances in excess of 40%. The top performers are Malta International Airport plc and Plaza Centres plc with gains of just over 46% each closely followed by Malita Investments plc with a share price appreciation of 45%. Many may question the reason for such strong increases in the share prices of these three companies. As explained in my article in mid-February titled “The search for yield”, following the significant decline in yields across the sovereign and corporate bond markets as a result of the quantitative easing programme by the European Central Bank, investors are now turning their attention to the equity market for a better yield. In fact, the surge in the share price of the airport operator materialized after the company announced a 77.8% increase in the final dividend to shareholders on 25 February following another record financial performance by the company with pre-tax profits climbing by 15% to €26.1 million. Plaza and Malita are two of the property companies with a business model that can produce sustainable dividends on an annual basis. The share prices of these two companies rallied again during the first quarter of the year following double-digit gains also in 2014. While the final dividend of Malita was only marginally higher, Plaza reported a double-digit growth in profits and on the back of this, dividends increased by 12.6%. The other property company with a similar business model, Tigne Mall plc, saw its share price rise by 25% and this ‘under-performance’ compared to its peers is probably due to the fact that the company had not yet published its financial statements by the quarter-end. In fact, Tigne Mall is due to publish its 2014 financial statements and announce its final dividend today. The search for yield was not only evident among these equities but also spilled over onto other companies. This intensified in March with trading activity across the equity market surging to almost €9.8 million as investors also focused on other equities including the two large retail banks which continue to dominate equity volumes. During the first three months of 2015, trading activity across the equity market amounted to €20.8 million, the busiest quarter since the first three months of 2008 when equity market volumes incidentally also amounted to €20.8 million. Medserv plc ranks as the fourth best performer during the first quarter of 2015 with a share price rally of 31% to a new record level of €1.90. The equity had performed positively in the run-up to the publication of the 2014 financial statements on 23 March as the market anticipated that the company will register improved profits and match the forecast of €2.2 million pre-tax profits that had been announcement at the time of the second tranche of their bond issue in the first half of 2014. The announcement on 10 March 2015 that the company was finally awarded the offshore maintenance contract of €4 million must have also positively impacted investor sentiment in recent weeks. The large part of the rally however took place immediately after the publication of the 2014 financial statements as the company reported that pre-tax profits exceeded projections and amounted to €3 million. Moreover, the upturn in the share price was also due to the fact that the payment of a net dividend of €0.056 per share is being recommended for shareholders’ approval during the upcoming Annual General Meeting. The substantial hike in dividend placed Medserv’s equity among the top dividend yielders in Malta. One of the most unexpected developments in the first quarter of the year was the agreement between the two hotel companies as International Hotel Investments plc announced that it agreed to acquire Island Hotels Group Holdings plc for a combination of €1 per share in cash and 0.246 IHI shares for each IHG share through the issuance of 9 million IHI shares to IHG shareholders. Both equities immediately rallied on the news and IHI closed the first quarter up 22.6% whereas Island Hotels gained 20%. This transaction is expected to be finalized in the coming months. Although the main focus during the first quarter was the search for yield across the equity market, the share price of MIDI plc still advanced by 12.5% notwithstanding that the company has not declared any dividends to its shareholders since its Initial Public Offering. Instead, this share price responded positively to the announcement that the company is currently in discussions with various third parties who have expressed an interest to invest in the Manoel Island project and MIDI confirmed that it intends to conclude an agreement with one of these parties. 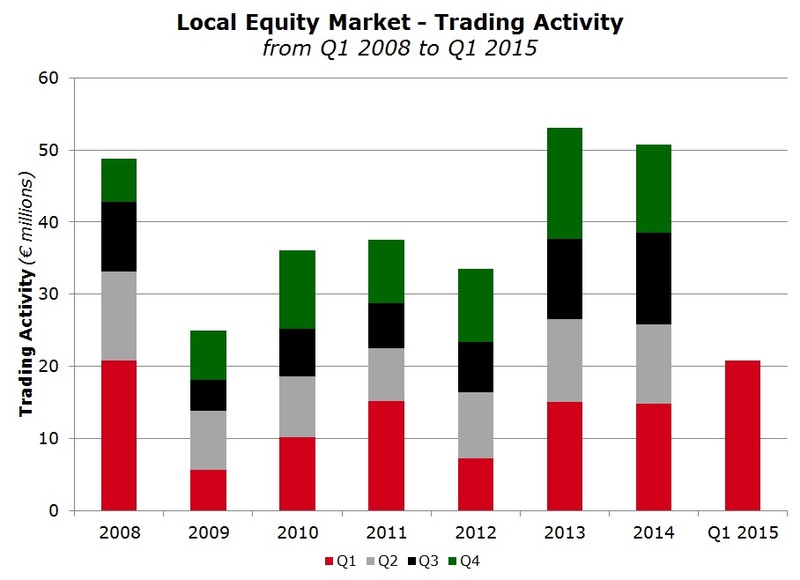 This confirms the increased responsiveness by the local equity market to company-specific developments. Another important development during the first three months of 2015 was the successful takeover of Crimsonwing plc by KPMG. An Extraordinary General Meeting is taking place on 17 April 2015 which will then lead to the delisting of the company’s shares from the Official List. The only negative performer since the start of the year was FIMBank plc as its US Dollar denominated equity lost 16.7% to close at the USD0.50 level after recovering from a fresh all-time low of USD0.43. Sentiment towards the company remained negative at the start of the year in anticipation of the 2014 financial statements and following the credit rating downgrade by Fitch. The international rating agency downgraded FIMBank’s rating to ‘BB-‘ from ‘BB’ citing the significant deterioration of the Bank’s asset quality, resulting in unstable and weak earnings. FIMBank issued its 2014 results on 11 March and reported a pre-tax loss of USD53 million. While the equity market threw up some surprises during the first three months of the year, the extent of the continued positive performance of the bond market may also have caught many investors unaware. The Rizzo Farrugia MGS Index climbed by a further 5.3% with all the medium and long-term Malta Government Stock prices rallying to consistent fresh record levels following the official announcement of the quantitative easing programme. Trading activity across the MGS market surged to an all-time high of €143 million during the month of February but declined sharply to below €85 million following the huge over-subscription of the new 25-year issue and the resultant lack of supply on the secondary market. On the other hand, the new issuance market for corporate bonds was much weaker than expected especially after the Malta Stock Exchange had published a tentative calendar revealing the potential of up to €172 million in new bond issues during the first six months of 2015. While some may have been delayed due to the stringent requirements and timeframes for preparing all documentation and obtaining approval from the authorities, others may have been cancelled outright due to changing circumstances. The demand for fixed interest securities by both retail and institutional investors was very evident again during the February MGS issue and hopefully various investment opportunities will hit the market during the second quarter to provide suitable avenues for the growing investor population. The second quarter of the year will be dominated by the remaining full-year results announcements of Tigne Mall plc, RS2 Software plc, 6pm Holdings plc, MIDI plc and GlobalCapital plc which have to be published by the end of April in accordance with the Listing Rules. However, the more important development for the equity market will be the publication of the interim financial statements as at 31 March 2015 of Bank of Valletta plc especially following the surprise announcement last Thursday 2 April about the legal proceedings that have been instituted against the Bank before an Italian Court whereby it is being requested to pay a sum of up to €363 million. Although BOV announced that it received a legal opinion clearly stating that there is no basis at law for the claim as it is completely unfounded, this major item is likely to dominate sentiment around the Bank’s equity until further clarity is provided to the market at large.